Tall Tree Music Festival Announces Lineup! The 2014 Tall Tree Music Festival Announces Full Lineup Featuring: Dan Mangan + Blacksmith, The Dudes, Sonreal, Tipper, Pickwick, Jon and Roy, Bear Mountain, Head of the Herd, Longwalkshortdock, Good for Grapes, Smalltown DJ’s, The Matinee, Lindi Ortega, Pete Murray, Mat The Alien, Shane Phillip, Neon Steve, Bestie, Sabota, Pigeon Hole, Acres of Lions, Kuba Oms, Wood N Soo, Quoia, Skiitour, The Roper Show, Vinyl Richie, Carmanah, Sam Weber, Deep Sea Gypsies, Monolithium, Max Ulis, Nordic Soul, Murge, Thieves, The New Groovement, Generic, Grossbuster, Bonehoof, Sam Demoe, Isobel Trigger, Davenport, Electric Oak, Righteous Rainbows of Togetherness, WMNSTUDIES, Leisure Suit, Matt Rose, Philthkids, GI Blunt, Degree One, San Felix, Funkee Wad, Outsider, Koosh, Willist, Mr Moe, HQ Soundsystem, Primitive, Mykee, DJ Anger, Jetts, Natron En Noir, Mt Doyle, MC Mullet Man, Buck Lee, DJ Trever, Scott W and Laggards. June 27-29, 2014, on Browns Mountain, Port Renfrew B.C. 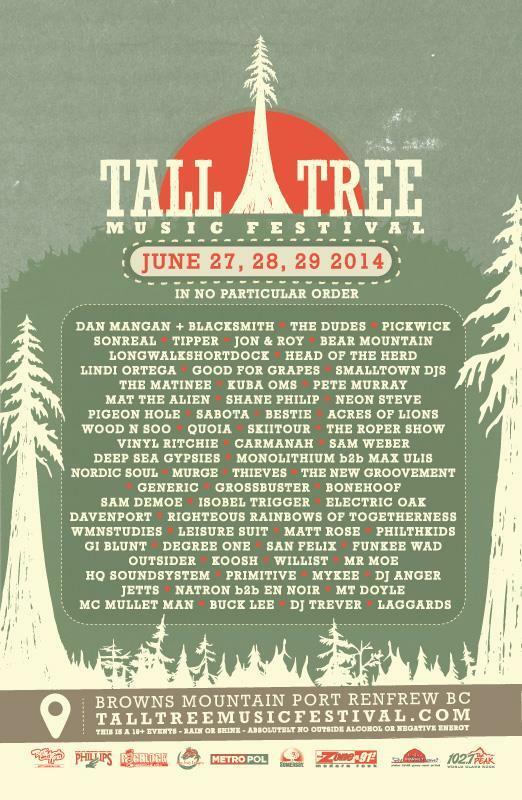 2014 marks the fifth annual Tall Tree Music Festival held atop Browns Mountain in beautiful Port Renfrew B.C. Canada. Tall Tree Music Festival, one of B.C.’s premiere boutique music festivals rounds out its lineup with exciting and diverse emerging artists and established favorites. The three day multiple stage and onsite camping festival is expanding this year with more capacity, vendors, activities and sponsors than ever before. Selling out in 2013, Tall Tree Five is expanding due to interest and demand from Western North America. To kick off the milestone fifth year, official launch parties will be held on Friday, April 18 at HQ in Victoria B.C. and Saturday, April 26 at The Electric Owl Social Club in Vancouver B.C. Fort Knox Five, Sam Weber, Thieves, Skiitour and DJ Nigel are some of the talent set to play, more announced soon.